In Subsurface Circular, you ride a subway full of robots going about their daily lives. Your job is to help solve their problems, but there’s a catch: you can’t ever leave your seat. The game came out on PC last August, but, like most things, it’s even better on the Nintendo Switch. Subsurface Circular is a game by Thomas Was Alone developer Mike Bithell that’s available for Switch today. The player controls a detective robot who is “geo-locked” on the titular Subsurface Circular subway train. After a concerned robot approaches them for help searching for a missing friend, they must solve the mystery behind a growing epidemic of disappearances. Subsurface Circular’s futuristic society might be a technological marvel of massive cities and sentient robots, but it still has traces of the everyday life we know. Tourist bots look for directions and tell stories about the cities they’ve seen. Weary pastors expound on their religions, proselytizing to anyone who might listen. These are variations of conversations I’ve heard while riding the L train back home into Brooklyn, where tired businesspeople occasionally break the stern New York silence to mutter about current events. Subsurface Circular’s world is far advanced from our own, but it’s peppered with mundanities that help it feel like a real place. The features of the Nintendo Switch port capitalize on this believability. 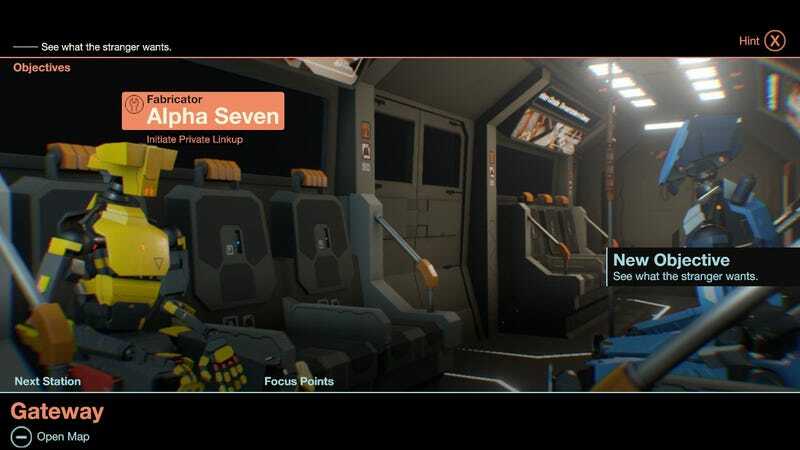 Subsurface Circular uses the Switch’s gyroscope features in handheld mode to allow players to tilt their screen to partially look around the environment. Seeing the background tilt and shift depending on how you’re holding the console feels a bit like craning your head to peek towards the end of a subway car at the latest commotion. Liberal use of vibration makes sure that every bump and passing subway train is felt. Subsurface Circular’s moody, contemplative vibe is enriched by feeling the rhythmic bumping of the train car as you play. Touch controls also help conversations flow more than they did on PC. Subsurface Circular is a visual novel at heart, with tangled dialog trees that veer off in numerous directions. Reaching out and tapping your next dialog option helps conversations progress at a more natural pace. Slipping from question to question and managing your responses by touch is snappier than on PC, complementing the sharp writing. Subsurface Circular was one of my favorite games from last year given its intriguing mystery and varied social commentary. The Switch version picks up the pace and adds even more character to an already fascinating story. And, for extra fun, you can now play it on the subway.